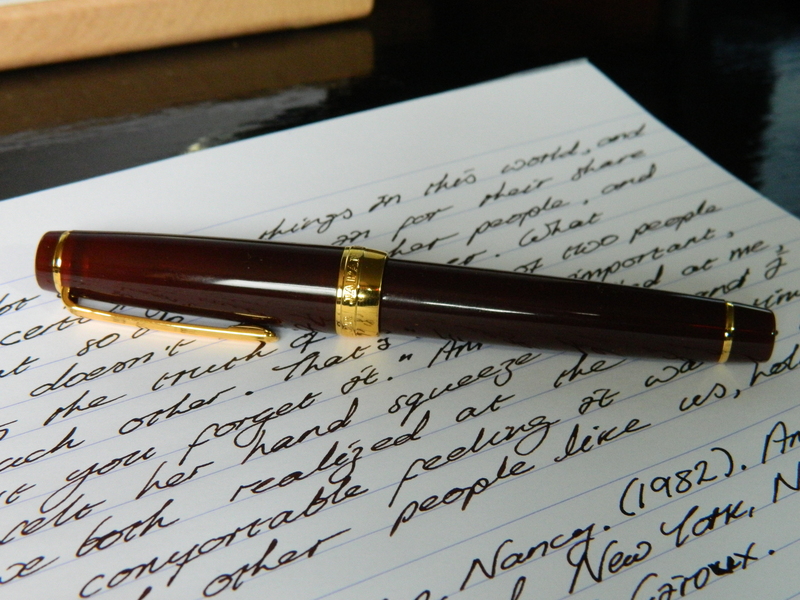 … and the Pro Gear SE Earth (the Classic, not the Slim this time), is bigger all over, and is simply, an all-round magnificent pen. If it were a bald gunslinger, it would lead a band of seven heroes to the rescue of a small Mexican village. But I didn’t know that at the time. What I needed to do, was to get my hands on one and try it out. At least, those are their details for the moment. The Wonder-People are in the midst of closing down the Carlaw Avenue store, and moving everything into two new sites in Toronto, whose locations are still firmly under wraps. I wish Jon and Liz the very, very best of luck, and the same to both the children and the extended family of two- and four-legged loved ones. As usual, Jon and Liz came through, and a week after my initial inquiry, the pen was sitting on my desk. How’s that for service on ordering and delivery of a non-stock item, in the midst of—shall we call them—other operational concerns? The increase in size over the smaller Sapporo (although not much) is just what was needed to make the pen sit more comfortably in my hand. I prefer to write unposted, and as you can see, there’s only around 5mm difference in the length of the pens without their caps. It’s not much, but coupled with the extra (>5mm) girth of the pen, it makes it much easier for me to handle without it slipping through my grip. 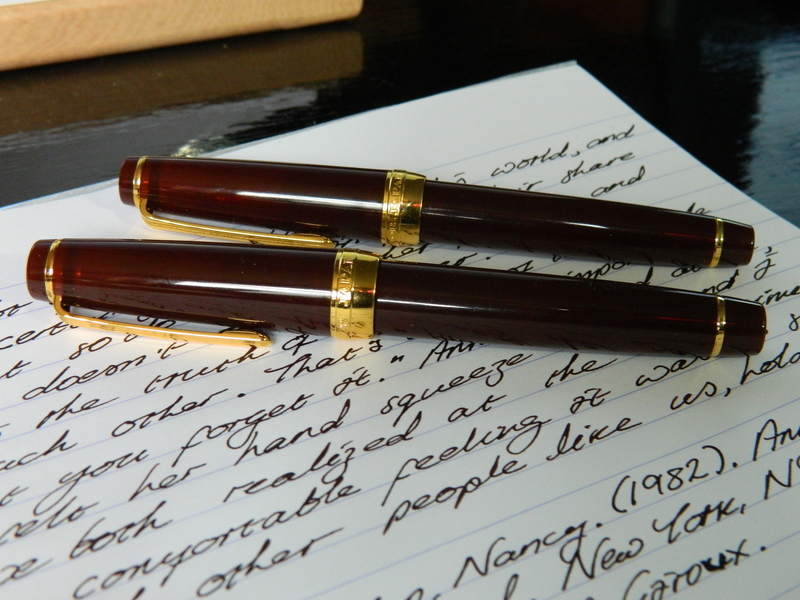 If I thought the 14K gold nib on the smaller Sapporo was nice, the 21K nib on the Pro Gear SE Earth (let’s call it the Classic for the sake of clarity shall we? ), is as near to perfection as I think I am ever likely to experience. Although I am waiting on a Sailor 1911L with a 21K nib, currently being worked on by Mike Masuyama, and a 14K Lamy 2000 that’s with Daniel Smith, so who knows? 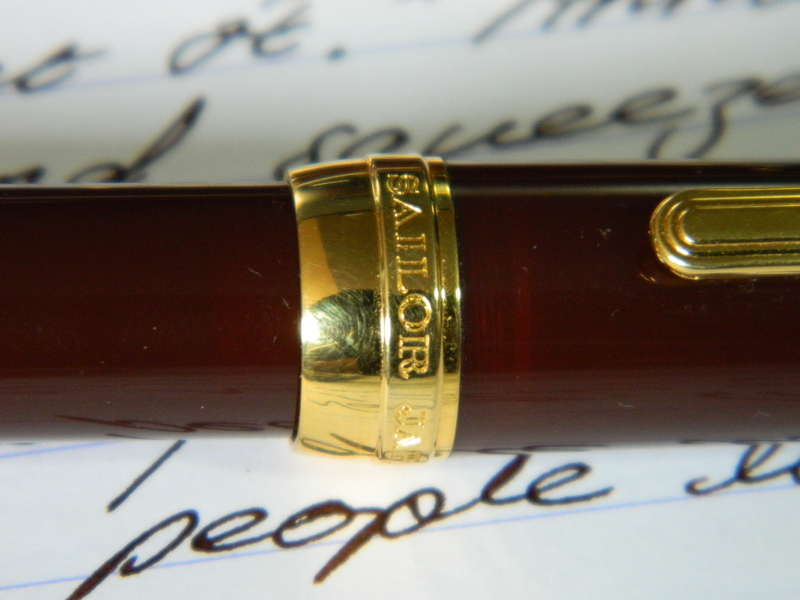 But right now, this is as near to the performance of what I would consider my grail pen, as I can imagine. 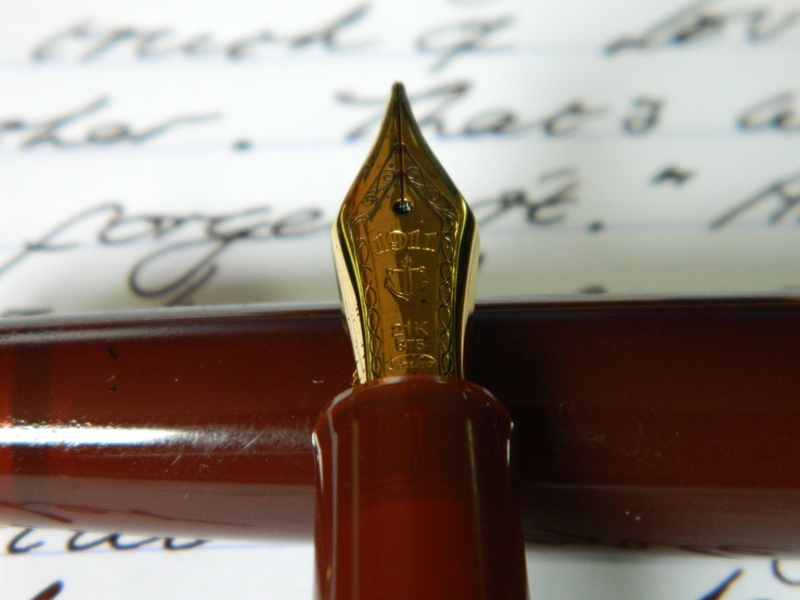 The nib is as smooth as butter, with just a hint of feedback to let you know that it’s in contact with the paper. I opted for Sailor’s broad nib once again, because these come up at about what I am used to as a medium. Also, if I find that I do want some work done on these nibs, then I imagine (you’d have to ask Mike or Daniel—see above—for confirmation), that turning a broad into say, a medium stub, would be pretty achievable for someone of a nibmeister’s skillset. 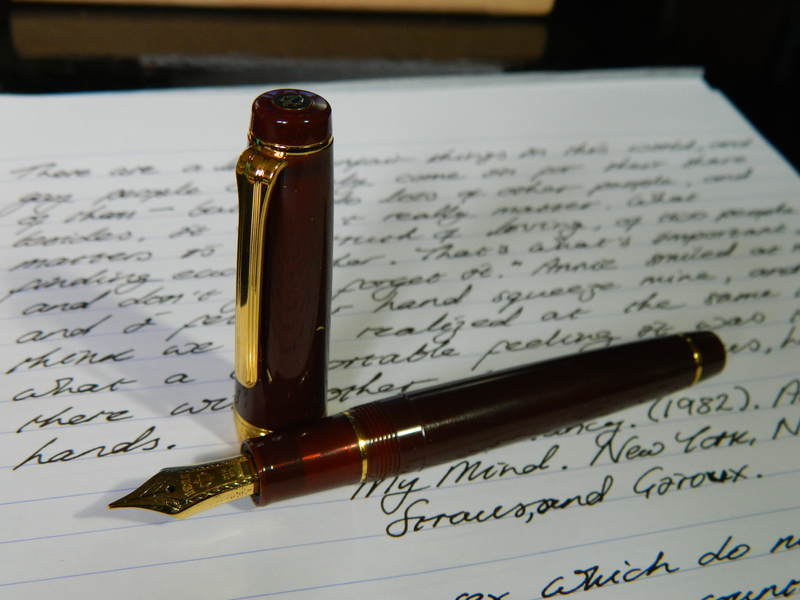 I filled the pen with Diamine Chocolate Brown ink. This has a great, deep, rich tone, and runs very wet in any pen I’ve tried it in; the paper is a Clairefontaine Triomphe, 90gsm, lined, white, A4 notepad. 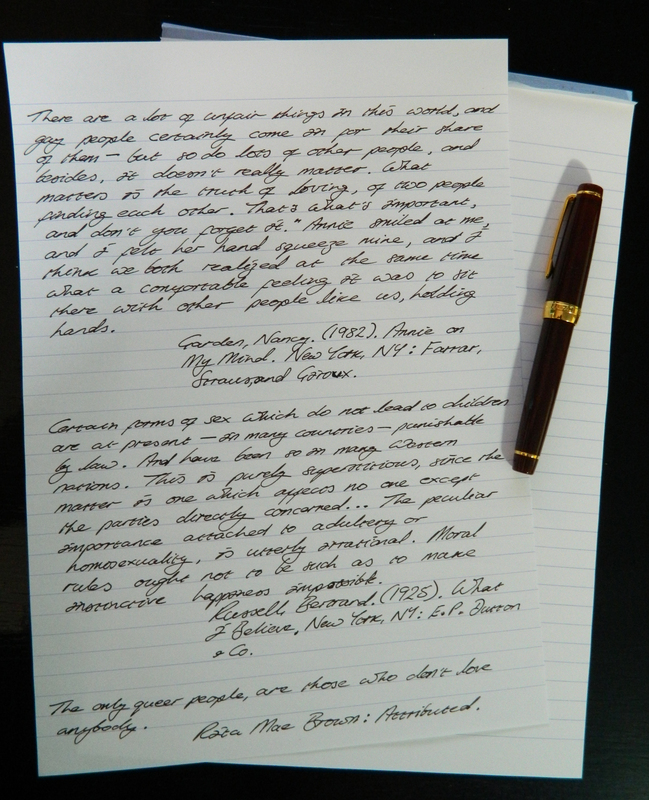 My photography and lighting doesn’t do it justice, so I didn’t bother putting the pictures up here, but I think that the best combination for this pen and the ink, is using 52gsm cream Tomoe River paper. A full review of just how attractive this pen is, isn’t really necessary here, since it’s basically a bigger version of the Sapporo; but still, it is absolutely gorgeous. 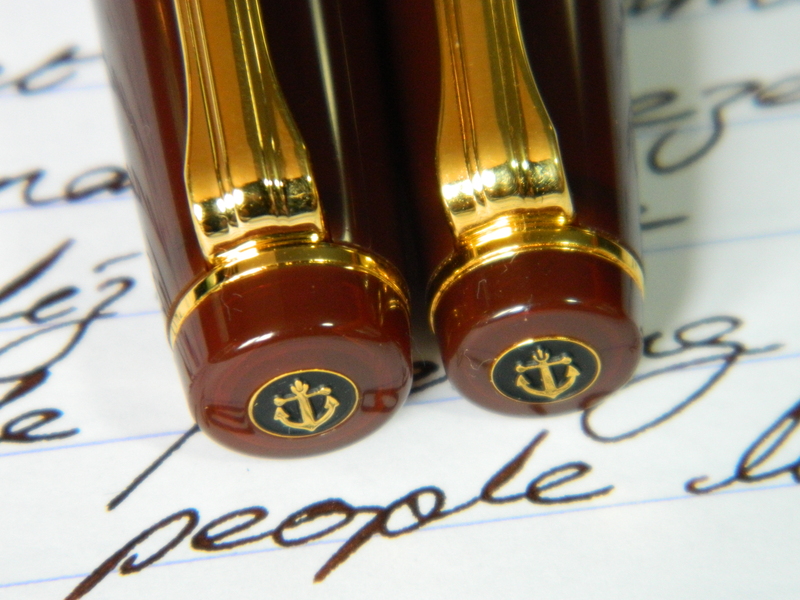 If this pen were a Classic Malt Scotch Whisky, it would be Lagavulin. Not as expensive as some, but not bloody cheap all the same; a beautiful color; an earthy finish; and a glorious experience when you’re on the receiving end. … in the same way as I may never need another whisky. Congrats! Now we are pen twins, except (i) mine has an extra-fine nib, and (ii) unfortunately my cap does not screw on perfectly (it has a hitch). If I ever have a spare moment I may contact Itoya service about whether they can replace the cap on mine. On a pen this expensive, it’s annoying, I have to admit. Thank you! That is more than annoying on something like this… and I’m curious, how fine is a Sailor extra-fine, when even their broad comes up as a medium? That’s a beauty. I have not seen one in the flesh but the colour looks stunning. The SE Earth is very attractive, and it seems that I have been very lucky with the Sailors I’ve had over the last few years. 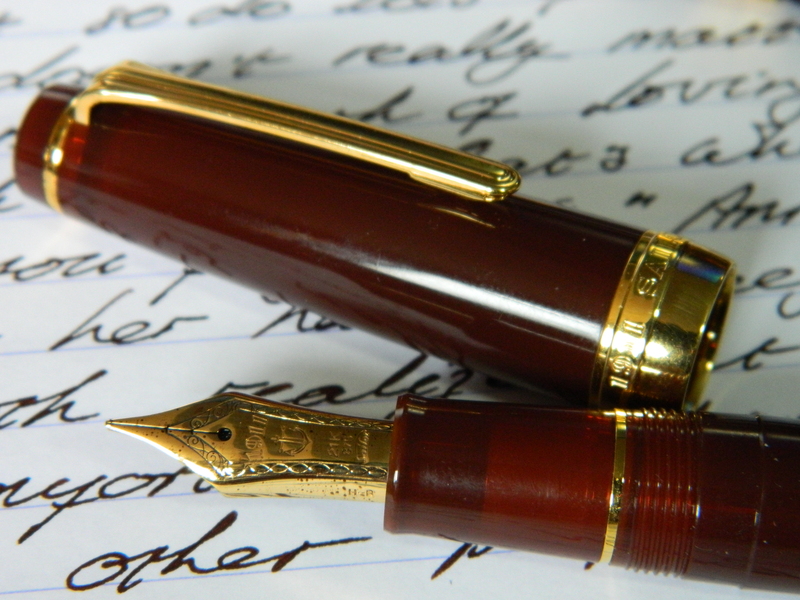 Each one has not only been a beautiful pen and writer, but the build quality has been second-to-none. Brad Dowdy of The Pen Addict reviewed one of these a while back, and he had a problem with some sort of corrosion around the cap band, which seemed to be part of a larger batch issue. Quality control in luxury goods, now there would be an interesting consumer report. Looks beautiful, but out of my price range. Now let’s discuss social justice. (I thought you were a bio student??) Have you read Alan Johnson? I am a bio student, or was, I’m (currently) looking at publicly controversial issues in science education. Topics where the science has achieved a consensus amongst specialist researchers, but still engenders great debate in certain sectors of society (e.g., vaccines, especially childhood vaccines; evolution vs. creationism; anthropogenic climate change; and currently marketed GMOs in the human food chain). I’ve also chimed in on a few debates around the biology behind race, and the biology of “binary gender”. So, I bring a perspective to some social justice issues that can be new for some of the sociologists and trainee teachers that take the course. Alan Johnson? The British Labour politician? I haven’t read much, some articles, that’s about the sum of it. In terms of true social justice work, I’ve been more Noam Chomsky. Maybe you need a second blog with a different focus, because I’d love to hear more about your personal intersection between these fields, too. I’d take that class!